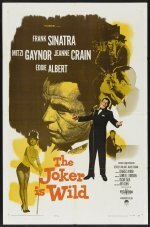 This workmanlike and overlong biography stars Frank Sinatra as comedian Joe E Lewis, whose vocal chords were seriously damaged by nightclub racketeers in the 1930s, which put paid to his original career as a singer. Lewis's stormy life and battle with alcoholism is not a lot of fun, though Jeanne Crain and Mitzi Gaynor add glamour as his two wives. Sinatra sings some good vintage numbers, and the film also features the Oscar-winning 'All the Way'. Vaudeville legend Sophie Tucker is briefly seen playing herself. This is classic Sinatra! This version of The Joker Is Wild is from a digital tv transmission and is far superior to any other version available on the internet.